At the end of a long dirt driveway lined by 26-year-old pine trees in Middle Georgia, sits The Old Home Place, where my family has celebrated “The Cookin’” each Christmas for more than 30 years. Since the mid 1950s, the Faulks have gathered in Twiggs County during Christmas week to eat, drink and be merry–and to slow roast hog meat in an outdoor, handmade fire pit. The Cookin’ began as a prerequisite to Christmas Day, when the pork would be the main event at the Faulk Family Christmas Party. For as long as I can remember, The Cookin’ has been a part of my holiday experience. I can’t imagine a Christmas without it. Growing up, The Old Home Place was my granddaddy’s house, a large white wood framed home with a wraparound porch, where my dad and his four siblings–two brothers and two sisters– were raised. My granddad, Joe W. Faulk, Jr., or as he was nicknamed, Baby Joe, carried on his father’s tradition and passed it on to his children, who keep the practice alive still today. 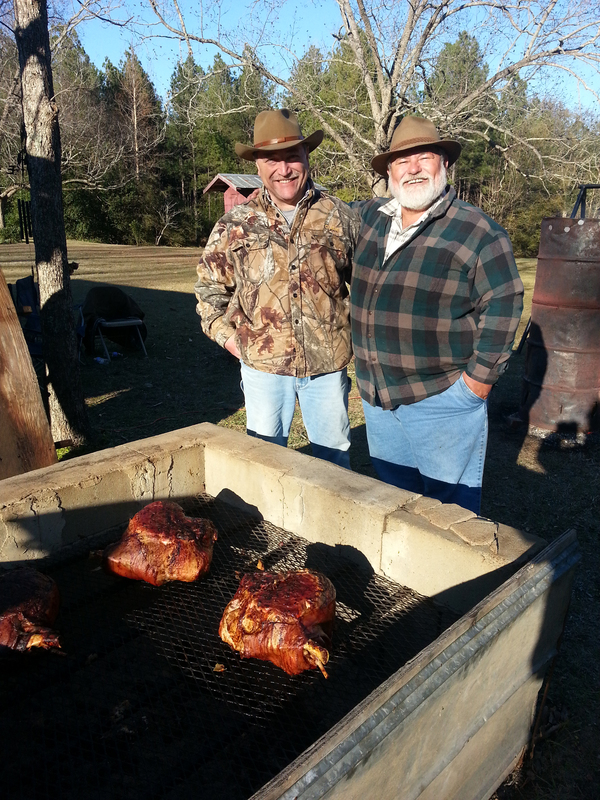 From left: Uncle Norman and Uncle “Bimbo” have been a part of The Cookin’ since the day they were born. The age-old fire barrel stands in the background. About two days before Christmas each year, my dad and uncles rise before dawn to pick up the hams and pork shoulders, slab side ribs and tenderloins from the local meat-packing house and return them to the pit, a 4 x 4 foot construction made of stacked cinder blocks fitted with a large grill grate and covered with a sheet of plywood. The meat starts cooking in the early morning for upwards of eight hours. 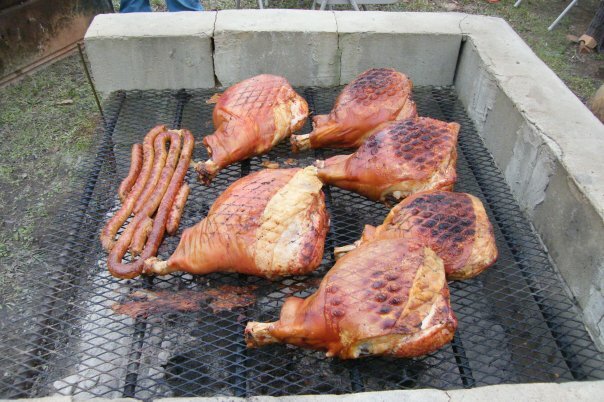 Smoked sausage is grilled alongside the hams to keep hunger at bay throughout the day. In the backyard near the pit, an age-old makeshift fire barrel stands tall and serves two purposes: creating oak and hickory wood chips for the pit, and putting off heat to tame the chill in the December air. Two 55-gallon metal drum barrels, ends removed, have been welded together, and a hole cut in the bottom just big enough to fit a flat shovel. Each time a log is added to the top, embers float into the air, dancing against the sky. Fire blazes against the night sky at the Faulk Family Christmas gathering. The day is filled with casual chatter about fishing, memories of relatives gone on and laughter between the five siblings who are all grown now with children of their own. Sounds of good music like, “Jeremiah was a Bullfrog” and Hank Williams’ “Family Tradition” set the tone as aunts, uncles, cousins and kinfolk gather around, sit on tailgates and walk about. Pets wander in the yard, and children play games on the property. As the hours pass, neighbors and friends come and go as they please, bringing snacks and desserts to share. 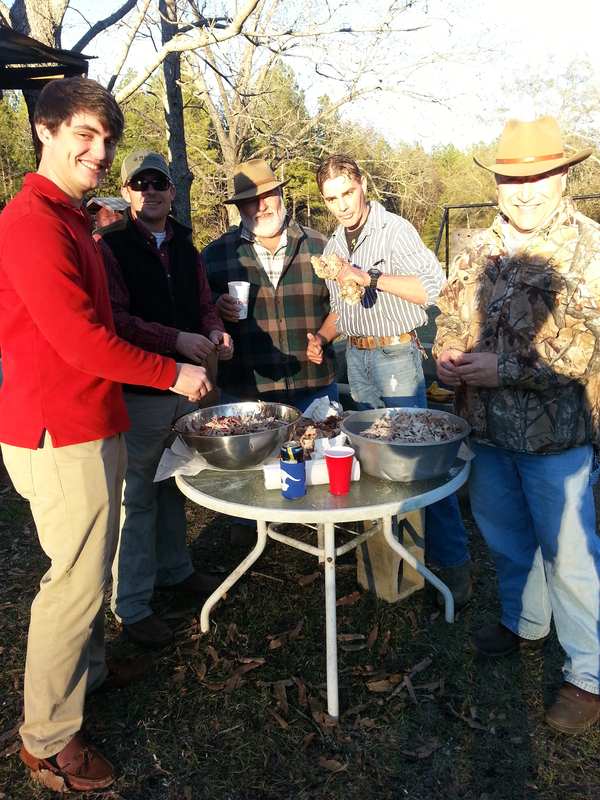 My cousins and uncles lend a hand to help shred the meat. From left: Park Burford, James Faulk, Uncle “Bimbo,” Randy Faulk and Uncle Norman. Around 4 p.m. when the meat is hot off the grates, it’s time to get down to business. 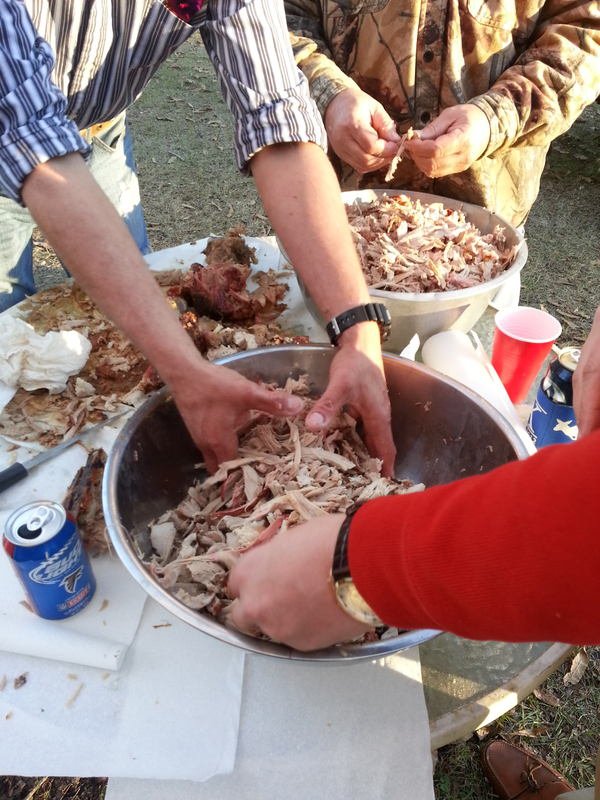 My uncles transfer the pork to a side table and pull it apart by hand. My granddaddy’s special recipe of barbecue sauce is added, and the meat is wrapped up and put away to be eaten on Christmas Day, while other hams are divvied up for individuals to take home. The meat is fall-off-the-bone tender after slow roasting all day. The Cookin’ was once just a common part of my family’s holiday routine, but as I’ve gotten older, I’ve come to appreciate the rich tradition it is today. Food ties us to our traditions. It’s the thing that makes us feel good and connected. Even though my Papa passed away when I was just 13, one taste of that fine Georgia barbecue and it’s as if he’s right there by my side. I can see Baby Joe now scooping those wood chips from the bottom of that barrel and shoveling them into the pit. When it comes my time to carry on the family tradition, I’ll continue it with great honor, together with my brother and our cousins. On this Christmas, I’m so grateful my ancestors began The Cookin’ so many years ago. It will be an event that creates lasting memories for years to come at The Old Home Place. This article first appeared in the Lifestyles section of the Statesboro Herald on Sunday, Dec. 15, 2013.